Note: The terms Match Categories and Match Criteria are used interchangeably in the hub and mean the same thing. How do I update Match Categories? 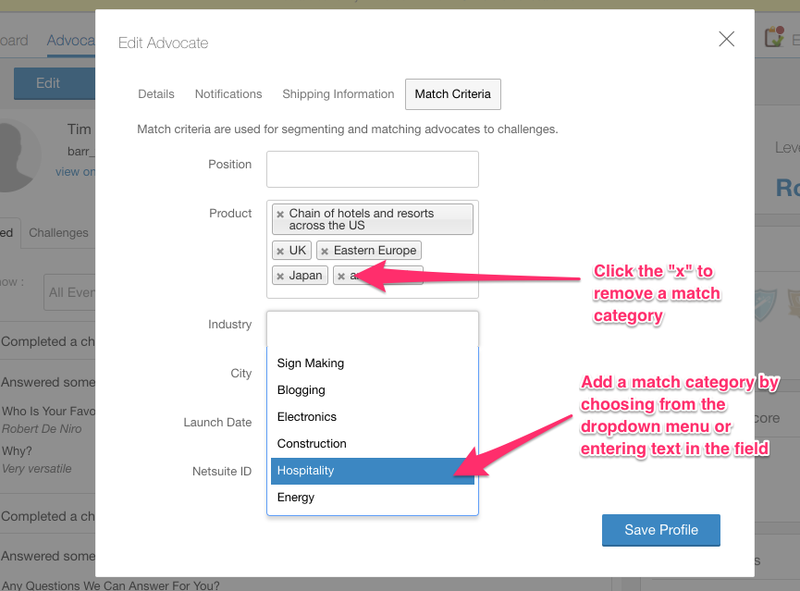 Match Categories / match criteria are AdvocateHub's version of custom fields. You can create as many as you'd like and name them whatever you'd like. The main purpose of match categories is for segmentation of your advocates for reporting and targeting. To create new match categories, go to Settings > System > Match Categories. To view the values of a current advocate's match categories, go to their profile page, click edit, and choose the "Match Criteria" tab. Match Categories can be update manually, one by one, through CSV upload, and via the Automatic Customer Data import feature of the Salesforce integration. 1. Manually update by editing their profile - this method is most suited when you only need to update a few advocates' profiles. To do this, navigate to the advocate's profile, click on the blue Edit button, and then click on the Match Criteria tab. Don't forget to Save Profile when complete. 2. Bulk Update using a CSV Import - if you would like to update several advocates all at once, this is the ideal solution. To do this, you will simply need to include the advocate's email address and the match category data that you wish to update in the CSV file. You can leave the rest of the columns blank. Importing blank values does not overwrite or erase previously existing data. Please view the detailed article on this topic for a deeper explanation. 3. Salesforce via the Automatic Customer Data Import - Please view the detailed article on this topic.